auto's exclusive High Line postcards. 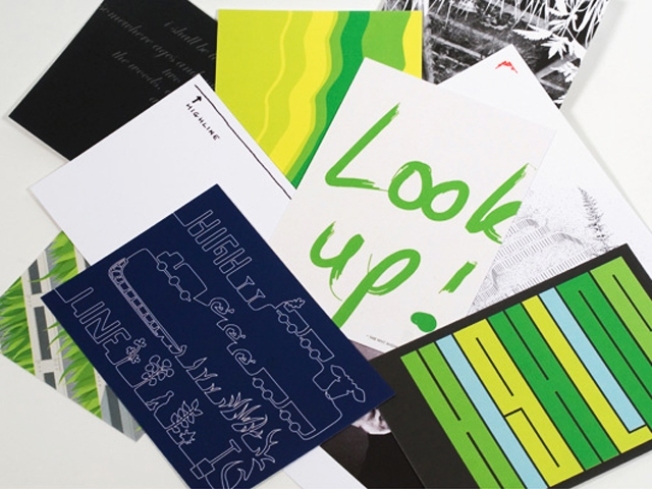 HIGHER GROUND: Sleek MePa lifestyle outfitters auto asked 10 graphic designers – from Laura Forde to Alan Dye -- to create a High Line Park-inspired postcard. Proceeds from the sale of the gorgeous results will go to park upkeep via Friends of the High Line. $10 at auto, 803 and 805 Washington Street near Gansevoort Street, 212-229-2292; thisisauto.com. TAKES TWO: Fashion blogs have called out Park Slope’s months-old Odd Twin Trading Company for its terrifically well-curated selection of vintage wear for men and women. The store’s been so busy, they’re only getting around to the launch party now – come by tonight for nibbles, drinks, and an extra 10% off all merchandise. 6-10PM; 164 Fifth Avenue at Degraw Street, Park Slope, Brooklyn; 718-ODD-TWIN. STOCK UP: For three hours only, score discounts of up to 70% off understated accessories from handbags to shoes at the Anya Hindmarch Friends and Family private sample sale. Anya Hindmarch, 115 Greene Street near Prince Street; 212-343-8147; anyahindmarch.com.